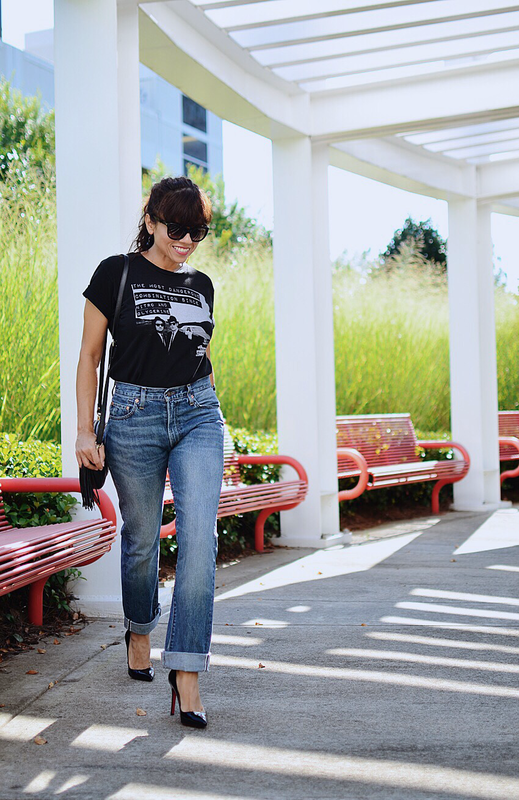 I'm probably too old for a graphic tee and jeans combo, but I'm not willing to let it go. And why should I have to? I prefer to find adult-friendly ways to wear this combo rather than giving it up altogether. One of the easiest ways for me to make this duet more "age appropriate" is by wearing it with a pair of classic heels, simply because they can add an instant touch of sophistication. For the gals that don't care for heels, a pair of ballet flats will do a better job than your Converse sneakers. Teens can louden up themselves with all type of accessories and make this combo look so cool. Me, on the other hand, and because I'm a 45 years old gal, I try to keep my jewelry minimal when wearing this edgy combo. If you noticed, I only wore a couple of vintage bangles and onyx teardrop earrings. The earrings add a touch of femininity and the lucite bangles compliment the overall look. I also could have worn a statement necklace, but I most definitely would have worn it by itself. I love the 80's! It was a great decade for me. My older son was born then, which made me a very happy person. I also love the music, fashion and movies of that era. 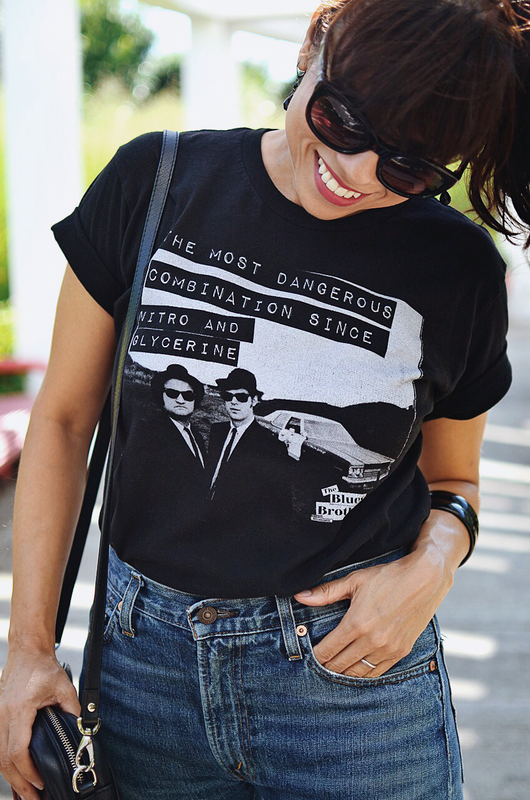 The t-shirt I'm wearing is from The Blues Brother's musical comedy film from 1980. The jeans aren't quite 80's-inspired; they are actually a pair men's 505 vintage (selvedge and big E on red tag) from the 1960s. They are a treasure nowadays and they fit me like a glove after professional tailoring. The jeans are not super high-rise, therefore I found them just right for wearing them with my graphic black tee. T-shirt: Old. 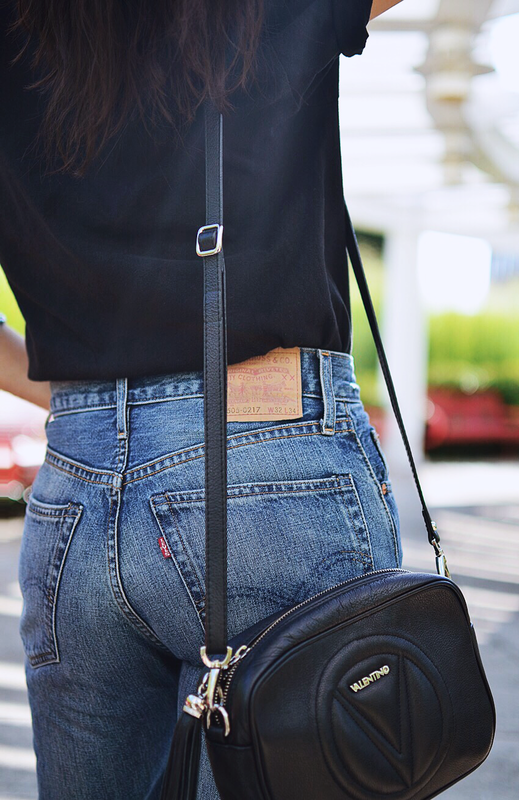 Buy here/Jeans: Levi's 505 (vintage). Modern & women's version here/Heels: Christian Louboutin. 85mm and 100mm/Bag: Valentino. Similar/Sunglasses: YSL. Similar/Bangles: Vintage. Similar/Earrings: Vintage. Similar. Thanks!! Raw denim will be my next pair. You look great and the outfit is fabulous. The fact that you had the jeans professionally altered is brilliant! Thanks!! Alterations sometimes get pricey, but they are worth it. Thanks! If I was you, I would request for the exact measurements of the jeans around the waist and length. They usually run 2-3 size smaller than modern jeans.